"So many paintings to paint...so little time." This Macro Floral Series was not a planned series. I started out with the White Echinachea and so liked the format and the size that I quickly painted another. I had a difficult time deciding on what flowers to paint because I had so many favorites. After I had painted a few I thought a series of nine would work really well framed up on a large wall but I wasn't quite done after I reached nine so I kept going until I felt I was done. Twelve seemed like a nice round number. 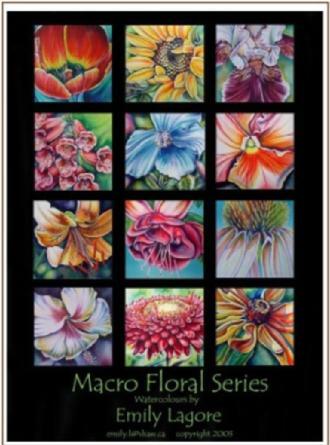 Macro Floral Poster - 29"x18" unframed $25.00 Cdn. All paintings are created using Artists Quality Winsor Newton and M. Graham paints on Arches watercolour paper.